PROAIM proudly unveils its full Movie Production Jib Crane Package that Stabilizes your camera for smooth and consistent video shots throughout large swooping motions. Our Proaim 22ft ultimate package enables you to capture the most picturesque shots at astonishing angles and raise the production value of any programme. The camera crane includes aluminium rock-solid heavy duty tripod stand with spreader to strengthen camera boom stability. The Portable floor Dolly comes with 360 degree rotating wheels to add dynamic movement to your shots. High grade Dutch Roll pan tilt head features 360 degree panning, tilting and rolling movement. We are extremely Happy and Proud to be a part of Mr. Sebastien's Journey of making this extremely successful Short Film featured across Various Film Festivals and Received an Award in the United Nations. Congratulations and All the Best for the Future ! This professional jib crane also comes with Proaim Lanc zoom controller that allows focus control and variable- zoom speed from slow to fast. The whole camera crane package comes in high impact protective packing for carrying, transporting and storing your valuable equipment. We offer the most comprehensive value added kit for turning your ordinary vista shots in to extra ordinary at a more than affordable price. Gets connected to most pan tilt in minutes, saving production time. The 22ft telescopic camera jib arm sections are made from hi-grade Aluminum constructions that makes it enough sturdy and robust. Its sections collapse into each other for compact storage. 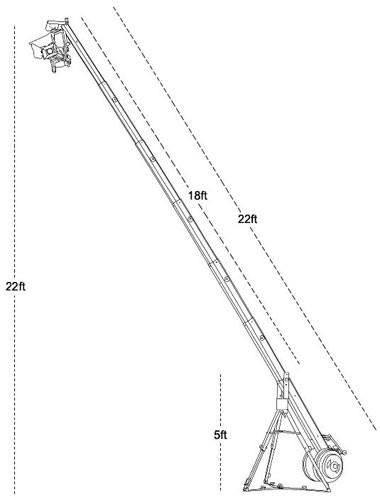 - Each jib arm sections are expandable from 4ft (one section) to 22ft (seven section) in 3ft increments. - Each extendable section is 4ft long giving 1ft overlaps between sections. - As each section is pulled from the previous section, you can store unused sections in the tail as ballast weight and lighten your counterweight demand. - The Rear Control Centre has provisions for mounting the Joystick Control box, LCD Monitor & Zoom Controller. - Jib crane sections collapse into each other for compact storage. The Heavy Duty Jib Stand (HD-STD) is a Rock Solid made of aluminum, a very robust and long-lasting stand ever-built. It has a strong hub assembly fully solid. The spreader feet are solid and have a double lock strong knob and locking pin as well. The spreader is fully extendable up to 2ft from its center. This Jib Stand supports and balances the crane perfectly without any problem. The Solid Jib Stand itself weights 17kg including spreader. HD-Floor Dolly is the most portable dolly in the market. It's a compact, lightweight and versatile pro dolly best suited for supporting all heavy duty stands. ur precision crafted PROAIM Gold Pan Tilt Head gives you incredible freedom of movement and gets you that money shot virtually anywhere. The PROAIM introduces its fully functional Gold Pan Tilt motorized camera head that offers 360-degree panning and tilting ability while keeping your camera safe and secure. It is exceptionally engineered electronic camera crane head to support cameras up to 7.5kg/ 16.5lb with ease. It features high-torque motors with 12v power and a joystick controller that provides smooth and accurate motion control. - The Proaim™ Pan-Tilt Head comes with a remote Joystick control system, 10 mtr. Long Cable and AC Adapter. - You may run the Joystick from a flat surface like table top or attach it to the boom arm of Jib. - Variable speed is easily adjusted by "Speed" and "Dead Spot" potentiometers on the control unit. Small movement – less speed. More movement – more speed. The Proaim Zoom Control for DV Cameras is a universal controller for LANC and Panasonic Mini DV or HDV cameras. It works only with most Sony & Canon cameras with a 2.5mm mini-jack LANC input and Panasonic models with a 2.5mm mini-jack Cam Remote input. A sensitive thumb switch allows for variable-zoom speed from slow to fast. The zoom lever allows you to zoom out to wide-angle or zoom in to telephoto. Lightweight and compact, this unit has an outlet cable and can be clamped on tripod pan handles, monopods, stabilizers, and other such devices. This tool / accessory roll pouch provides Rapid Access to Various Tools such as Allen Keys or wrenches. This premium quality tool roll has 10 Various Pockets to neatly organize a variety of hand tools so you can work quickly and efficiently.